Life as we know it: Happy Birthday David! David had his first Birthday on July 16th. I can't believe how fast time flies. I was gone on his Birthday, so we celebrated on Friday. We didn't do anything to exciting, we went out to dinner at godfathers pizza, opened presents, had cake and ice cream, and went to bed! Morgan was a little sad that David was getting all the attention. He had more fun opening t he presents then with the actual pres ent. 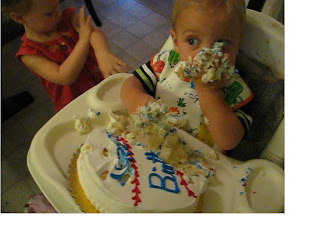 He went to town with the cake. He loved it! Happy Birthday David, and thank you for a wonderful year! You are such a sweet and loving Boy, I love you so mcuh! Holy cow, what a messy kid! He is opposite of Alex. That is really funny!